With foreign investors eager to acquire commercial properties in the United States, Seattle-based investment adviser Metzler Real Estate has stepped up the hunt for prime buildings for its overseas clients. “With as much global capital coming into the United States as there is today, it’s a challenge to place that capital to generate the returns that our clients want,” says Metzler President and CEO Don Wise. In the next three to four years, Metzler plans to spend between $1.5 billion and $2 billion on behalf of institutional and wealthy private clients in Germany and Asia, Wise says. Such a spree would bring the firm’s assets under management to more than $4 billion. Metzler’s presence in Seattle has helped fuel the local real estate market through a number of high-profile office sales and promises to continue to do so. The firm recently sold two prominent Seattle properties on behalf of its largest client, Hamburg-based Union Investment Real Estate GmbH. Fremont Lake Union Center, which Union bought in 2004 for $65.7 million, sold for $107 million; Fifth & Pine, purchased in 2005 for $55.1 million, sold for $70.6 million. Union Investment’s global portfolio is valued at about $25 billion, with Metzler overseeing about $1.5 billion in assets in the United States, mainly in core office properties in Seattle, Manhattan, Chicago and Washington, D.C.
Metzler also recently sold its only property in Portland, a 51-unit apartment building it developed with Portland developer Gerding Edlen on behalf of private clients, for $15 million. 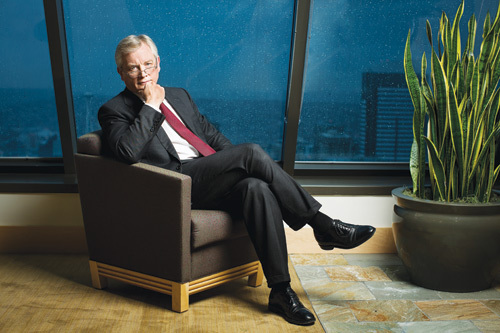 The Seattle investment firm was founded in 1976 by Germany’s oldest private bank, B. Metzler seel. Sohn & Co. KGaA, to help its bank clients invest in American real estate. The German bank’s customer relationships run deep: The same family has owned Bankhaus Metzler since it was founded in 1674. Metzler Real Estate has 17 employees at its Seattle headquarters and three in Atlanta. It offers four services: helping clients develop an investment strategy; acquiring properties for these clients; managing these assets, typically through an arrangement with a third-party asset manager; and selling them when the time is right. Locally, Metzler clients own the commercial portion of Millennium Tower (715 Second Avenue) in downtown Seattle, Bear Creek Corporate Center in Redmond, the Spokane Street Distribution Center in Seattle’s SoDo neighborhood, the Springbrook Business Park in Kent and the MasterPark garage near Sea-Tac Airport. In 2012, the Seattle firm made headlines in San Francisco with the $446 million purchase, on Union’s behalf, of 555 Mission Street, a 33-story office tower completed in 2008. It was the second-largest deal in the market that year, according to the New York-based real estate research firm Real Capital Analytics. Foreign investment in the United States started picking up 18 months ago, according to Real Capital Analytics Managing Director Dan Fasulo. The surge follows earlier waves of foreign investment in American properties between 1999 and 2001 and again from 2005 to 2007. What’s different this time around is that foreign investment is coming in from all around the world, Fasulo says, not just from Europe. Interest from investors in Asia, South America and Canada is heating up competition for prime buildings in Seattle and other coastal cities. Foreign investors appreciate U.S. properties because of the relative strength of the economy, the ease of doing business here and the liquidity of a real estate market that makes it comparatively easy to buy and sell. The increased competition has Metzler looking beyond the hot East Coast and West Coast markets. Wise says he is finding new opportunities in Texas. Wise also likes Houston, particularly the close-in Galleria area submarket, because of the city’s robust and increasingly diverse energy sector. Metzler will be looking for similar interior markets with good job growth. And the company continues to look for investment opportunities in the Seattle area. With more competition for prime properties, investors are broadening their definition of what constitutes an attractive investment, are considering a wider range of markets and are willing to take on riskier investments, such as buildings that aren’t fully leased, Wise notes. Presently, the firm has $2.5 billion in assets under management in a dozen markets: Seattle, Portland, San Francisco, Sacramento, San Diego, New York, Washington, D.C., Atlanta, Dallas, Austin, Chicago and Wilmington, Delaware. That’s not a large amount compared to behemoths such as publicly traded Blackstone, a New York investment adviser with $64 billion in assets under management. More direct competitors include publicly traded Paramount Group, a New York firm with $6.87 billion in assets under management. To build its Asian clientele, Metzler is tapping its parent company’s institutional relationships and making use of the bank’s offices in Tokyo and Beijing. “They have relationships with capital sources so we are not starting from scratch,” Wise explains. The firm currently represents investors in South Korea and Japan and is courting Chinese capital as well. Metzler is targeting the larger Asian pension funds that have the capacity to invest between $200 million and $500 million in commercial real estate in the United States, Wise says. Many Asian investors are new to the American real estate market. While Germans are comfortable buying properties outright, Asian investors may prefer the more cautious approach of being a minority partner in a deal, Wise says. Building clientele in Asia will require spending time in those markets and exercising patience, Wise says. Metzler seems up to the task. Metzler Real Estate’s current Seattle-area investments.